R Way is a 2012 26' Cutwater in nice condition with numerous upgrades.She offers a low-hourYanmar 180 hp main engine, Sidepower bow and stern thrusters, air conditioning/heating system,2500 watt inverter/charger, 140 watt solar panel, Garmin electronics, folding mast for low bridgeclearance, reversible transom seating, bow and stern boarding ladders, 2 stateroom layout andextra interior storage.She is for sale because her sellers are spending more time on their sailboatnow, so make sure to see this upgraded and well-maintained 26' Cutwater. West Florida Yachts would love to guide you through a personal showing of this 26' Cutwater c26 2012. This yacht for sale is located in Vero Beach, Florida and priced at $114,500. For a showing please contact us by filling out the form on this page and we will get back to you shortly! R Way is a 2012 26' Cutwater in nice condition with numerous upgrades. She offers a low-hour Yanmar 180 hp main engine, Sidepower bow and stern thrusters, air conditioning/heating system, 2500 watt inverter/charger, 140 watt solar panel, Garmin electronics, folding mast for low bridge clearance, reversible transom seating, bow and stern boarding ladders, 2 stateroom layout and extra interior storage. She is for sale because her sellers are spending more time on their sailboat now, so make sure to see this upgraded and well-maintained 26' Cutwater. From the fiberglass swimplatform, you walk through a transom gate onto the bimini covered aftdeck. Walk forward into the salon and you will find the guest stateroom access starboard aft, settee to starboard, helm starboard forward, mate benchseat port forward and the galley to port. Walk forward and step down into the master stateroom with v-berth and insert/hi/lo table. You will find the head to starboard and berth forward. The height in the stateroom is 5'11", 6' in the head, 6'6" in the salon and 2' in the guest stateroom. The master stateroom and guest stateroom berths are 6'8" and the salon settee berth is 5'6" long, when converted into a berth. R Way offers a master stateroom forward with a v-berth with an insert and hi/lo table, a guest stateroom underneath the salon with access starboard aft in the salon and a queen size berth. The salon settee converts to a double size berth. The salon offers a settee that converts to a berth to starboard, 4 overhead hatches with covers, bound carpet over teak & holly sole, fan, opening side windows with curtains and screens and an aluminum and glass door aft. The galley is located to port in the salon and offers an extended countertop when the port mate benchseat is folded forward. Dining space is available at the salon settee and the master stateroom hi/lo table. The master stateroom is forward and offers a v-berth with insert/hi/lo table, custom hanging/storage locker, 4 portlights with covers and curtains, 2 overhead hatches with covers, reading lights, shelves, bound carpet over teak & holly sole, storage underneath the berth, fan and ensuite head. The guest stateroom is underneath the salon with access starboard aft in the salon and offers a queen size berth, reading lights and shelf. 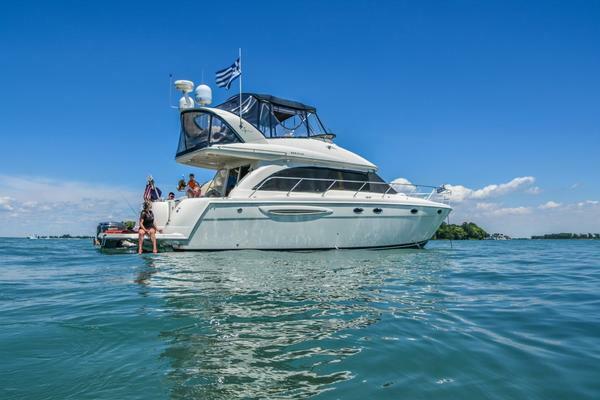 The helm is located starboard forward in the salon and offers a benchseat port and starboard, Imtra windshield wipers and a full electronics system.